Maximum 6 characters. The labels provided will be numbered consecutively, starting at the specified number. Asset labels and stickers. Part of our Asset and numbered label range. Assetmark jumbo label with text, and large format consecutive serial number sequence. Material self adhesive polyester, with laminated surface. Supplied in packs of 100 labels. Serial number labels. Assetmark jumbo. 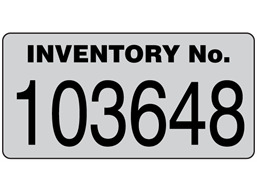 Consecutive serial number with text and serial number in black. Choose from 3 material colours. LFS03 Size 60mm x 120mm. Material self adhesive polyester, with clear laminate.